What it is is another Berliner weisse inspired beer from the Braeside barrel program and one that is the first in their "exclusive" series, where there's so little of a beer that it will only be available at the Barrel Room or a handful of selected partner venues (of which the Melbourne ones are listed here, with the others TBC). And, believe it or not, it's one to which elderflower has been added. 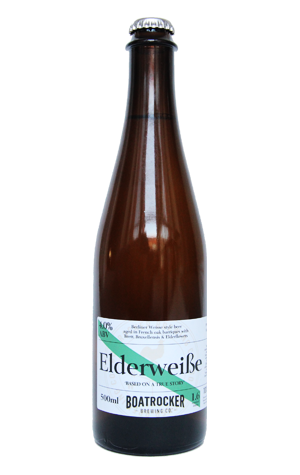 If you're familiar with the brewery's straight barrel aged Berliner weisse, Mitte, which is now to be released in 500ml bottles, Elderweisse a little cloudier, a little yellower, a little fuller, and a little funkier, with a musty floral aroma that's joined by oak and apple as it warms. There's plenty of oak and acidity to taste, plus a hint of smokiness and distinct citric characteristics. Taken together with the very fine spritz and drying tartness, it's not too dissimilar to a traditional French farmhouse cider, and one that should make a fine beverage for the dining table.